I always try and make edible Christmas gifts. This decision, made in November, always seems like the easy, simple and relaxing option. Instead of braving the hordes of Christmas shoppers, I envision that I will be smugly ensconced at home, effortlessly whipping up batch after batch of delicacies. The reality, however, is always far from this. I end up leaving it until the last minute, then spend a couple of days covered in smudges of chocolate, trying to hold back the stress-induced tears. This year was no exception. 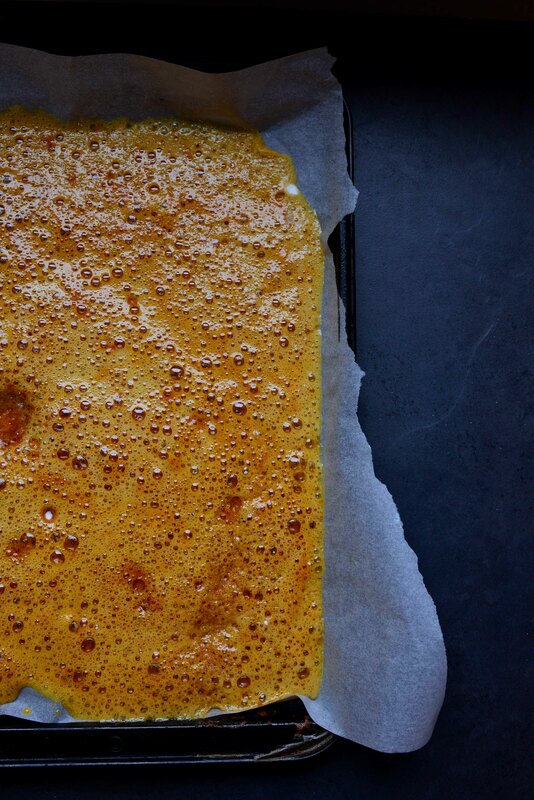 I chose to make honeycomb, having read several recipes that insist it’s a piece of cake, only requiring three ingredients and a casual fifteen minutes. Having seen the process on Masterchef, including the rather showy moment when the bicarbonate of soda is whisked into the caramel and froths up spectacularly, I thought that this would provide the elusive balance of ease and impressiveness. Oh how wrong I was. 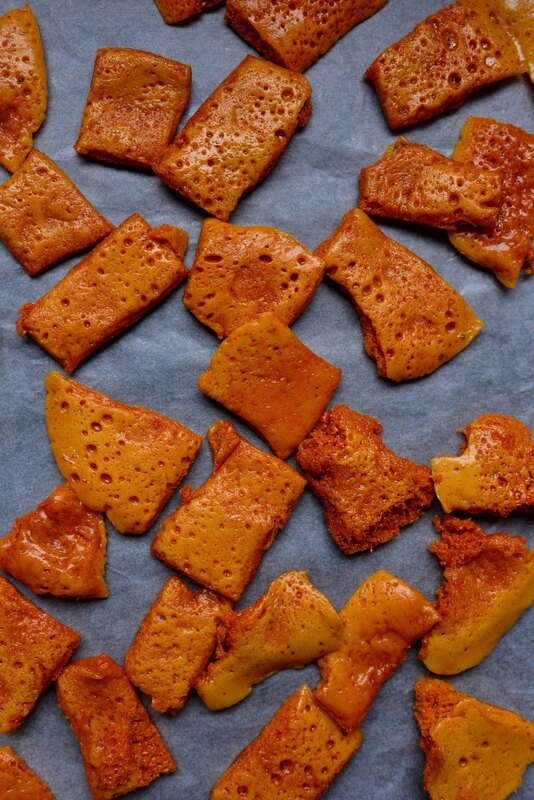 I ended up trying several different recipes, no one of which quite provided the desired effect of crisp, crackling honeycomb. One batch made nowhere near the quantity I had expected, requiring a dash to Sainsbury’s midway through to replenish my stocks of golden syrup and sugar. Another batch set too soft, rendering a hasty re-labelling of the finished product as ‘burnt sugar toffee’ (so you’ll know if you’re a recipient of batch one). Finally I found a recipe that seemed to set close to the imagined crispness, but still took a fraught three hours to firm up, in which I couldn’t resist wandering over and prodding it every five minutes. 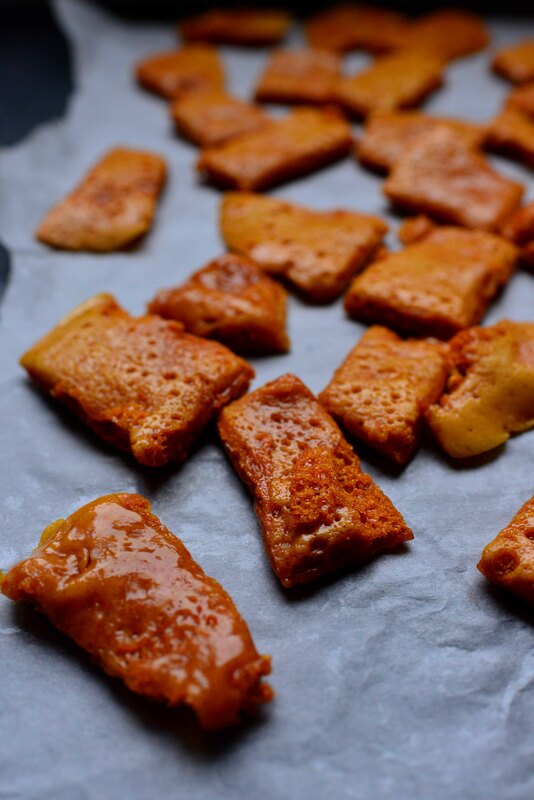 The resultant stickiness of the soft, toffee-like honeycomb was slightly maddening, as it stuck to the kitchen cabinets, my socks, hair and pretty much everything else. I was prising bits out from between the sofa for the rest of the day. 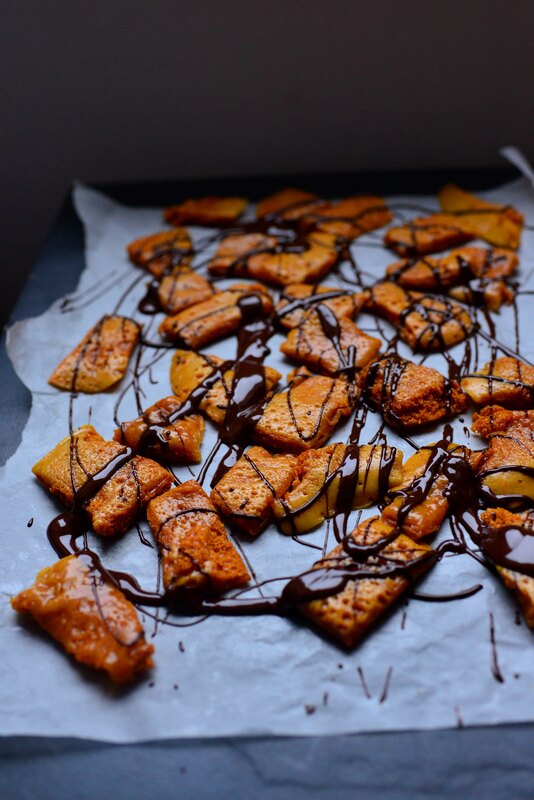 I slathered the end product, hastily titled ‘honeycomb toffee’ to account for said stickiness, in a generous amount of dark chocolate, the tied it up in cellophane bags. Finally, I sat down with a cup of tea, surveying the carnage that covered every surface of the kitchen, and wondering, as I do every year, whether simply ambling around the shops would be all that bad. I recently visited America for the first time. 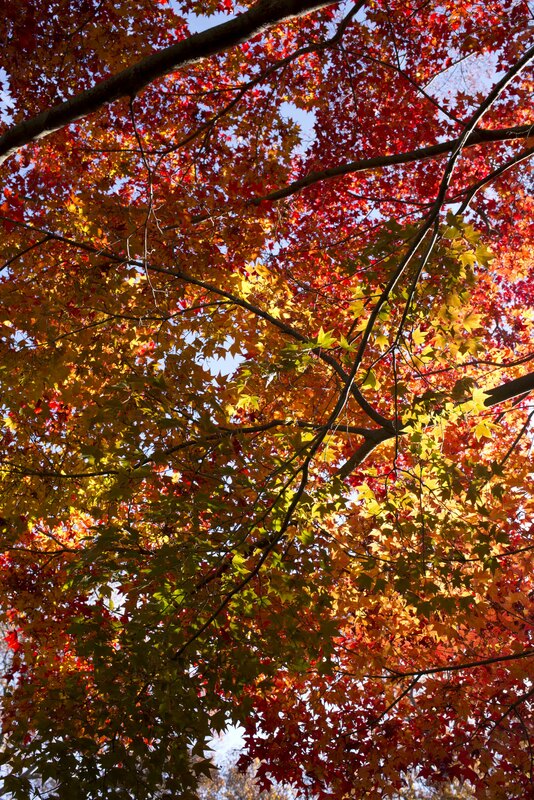 Boston to be precise, resplendent with the fiery colours of the New England ‘fall’. I was staying with my friend, and former food blog collaborator, Kristel, who is conducting some very complicated biological research at the Arnold Arboretum in Boston. America was a surprise in how much it seemed different to England in almost every way, even though the same language was being spoken. The food was a source of constant surprise to me: I found it difficult to restrain myself on my first trip to the supermarket – there were so many things that I had seen in films but didn’t imagine to exactly exist, that I then felt necessary to purchase. Such as pop tarts. These are an invention that never really caught on in Britain (although God knows why), consisting of a pastry shell filled with tooth-achingly sweet jam filling, that you warm up in the toaster. In the TOASTER. Baffling, but annoyingly addictive. As it was Thanksgiving season when I visited Boston, pumpkin was another foodstuff that was literally rammed down your throat at every opportunity. It popped up in coffee, donuts, cakes, pastries and pretty much everything else. I gladly embraced this, stopping for a Pumpkin Spice Latte (#psl) on every street corner. Also, being so close to such industrious maple syrup producing regions, such as Vermont, meant that it was nigh on obligatory to have maple syrup with every meal. We literally did this one day, taking it as somewhat of a challenge. We had maple syrup pancakes for breakfast, salad with maple syrup dressing for lunch, followed by a maple spice mocha and maple syrup “froyo” (frozen yoghurt), and then squash roasted in, you guessed it, for dinner. 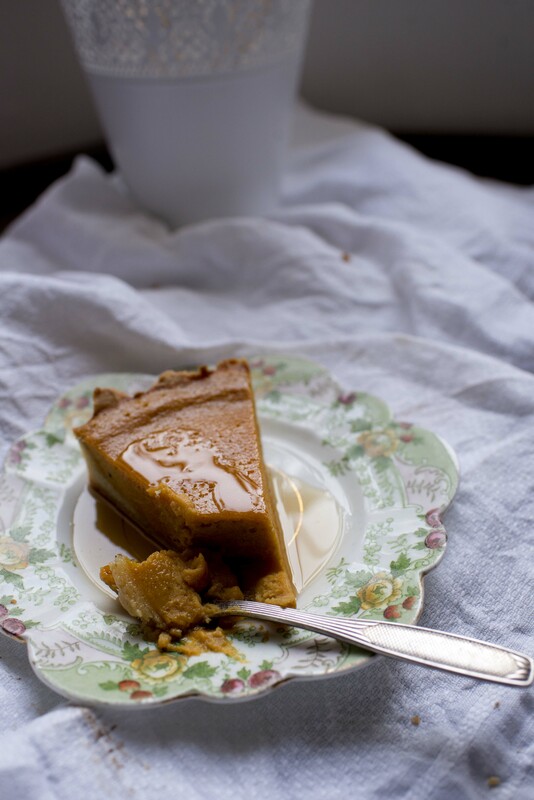 I decided to combine these two flavours in the classic Thanksgiving dessert of Pumpkin Pie. 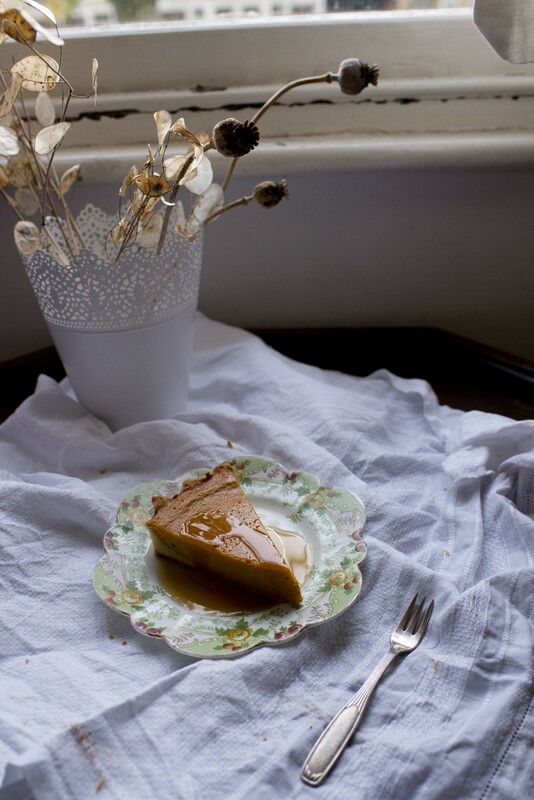 The sweetness of pumpkins (bought in a tin, to be true to the American recipe) marries very well with the nutty maple syrup, and the sourness of crème fraiche offsets the sweetness slightly. 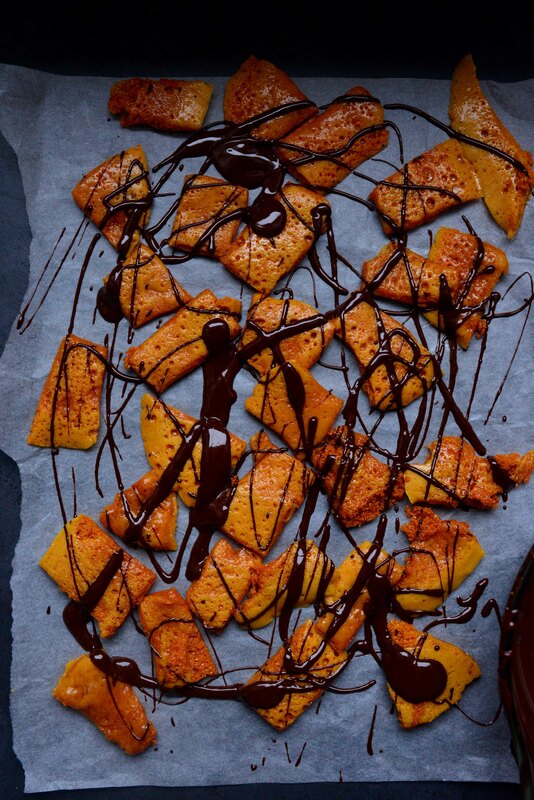 Around the latter days of November, my Instagram feed was clogged up with pumpkin pies, turkeys and the rather bizarre ‘candied yams’ (often involving sweet potatoes topped with marshmallows). 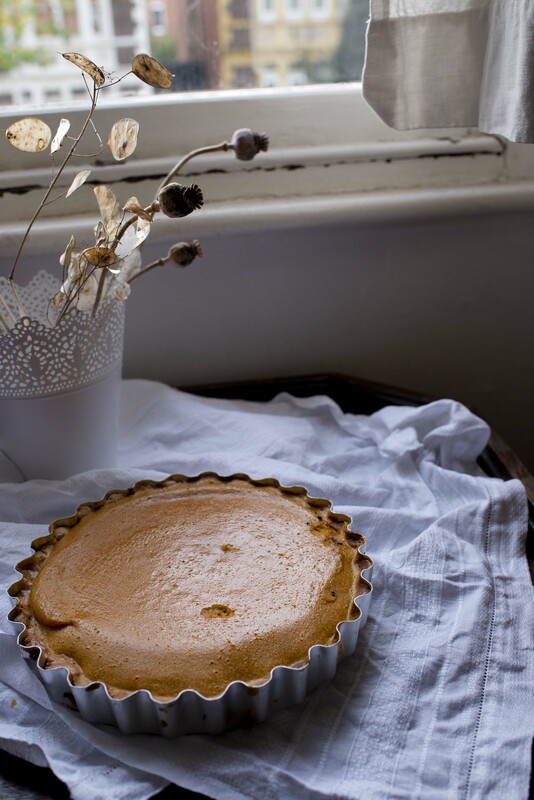 So I decided to jump on the Thanksgiving bandwagon and give a pumpkin pie a go. I used a recipe from Food 52 that was, to stay true to the American theme, measured in ‘cups’, but thankfully my conversion seemed to work out fine. Pumpkin puree from a tin is laughably easy, but you can make your own by boiling the required amount of pumpkin until soft, then mashing until smooth. 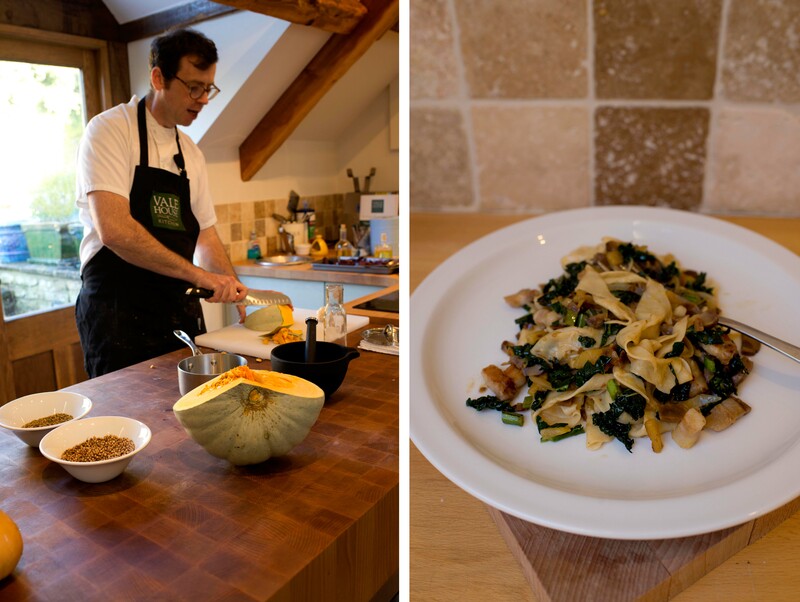 Last week I ventured out on a cold and foggy Sunday morning to attend a one-day seasonal cookery course at Vale House Kitchen. 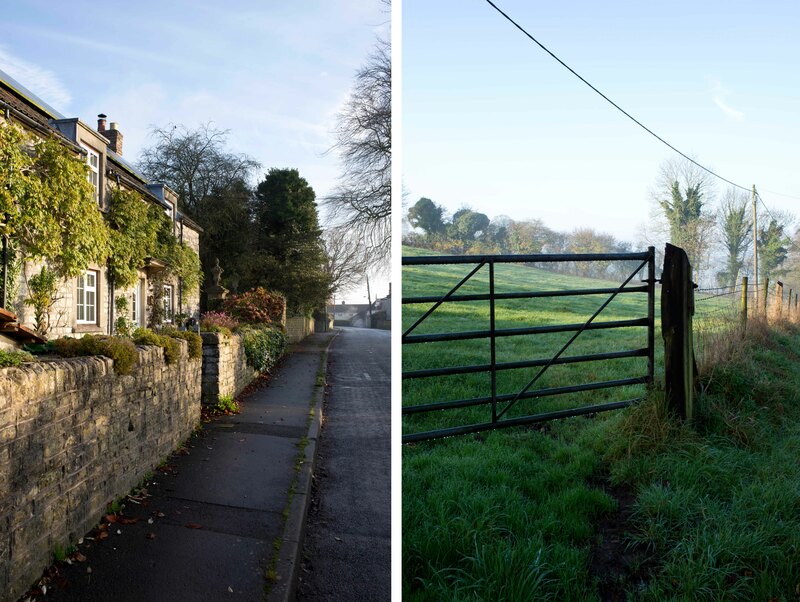 For about half of the drive to Timsbury, on the edge of Bath, I was convinced I was going the wrong way; the lack of signposts made every turn down the ever-narrowing lanes a leap of faith. The village finally materialised, it’s winding lanes and Bath stone houses looming out of the fog. Here sits Vale House, a bucolic paradise surrounded by apple trees, greenhouses and a veg patch, as well as free-ranging chickens and pigs. 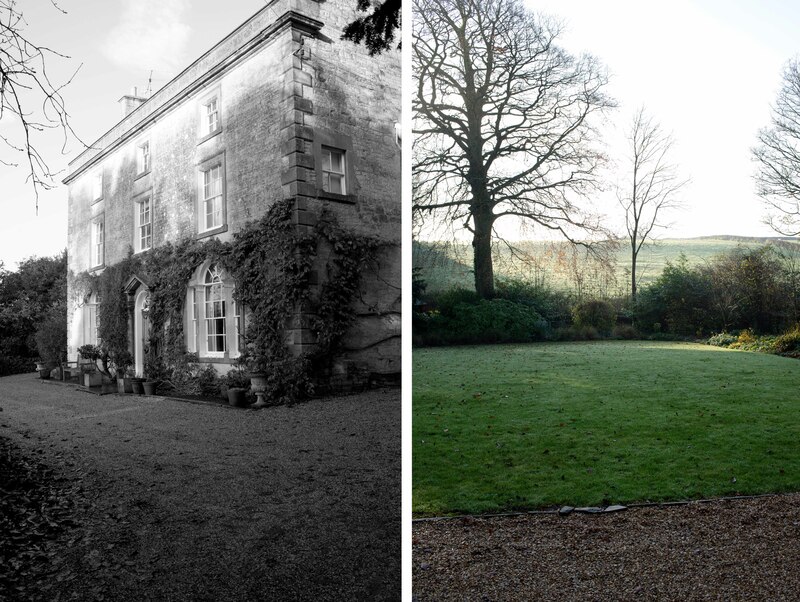 The cookery school itself is located in a beautifully converted outbuilding. I was greeted at the door by hosts Bod and Annie, whose passion for food and the countryside is as infectious and ever-present as their welcoming smiles. Balanced on Annie’s hip was their eighteen-month-old son, who would later gorge on beetroot like it was going out of fashion, and who, Bod exclaimed gleefully, ‘also eats partridge!’ We were then introduced to our tutor, Tim Maddams. I only just stopped myself blurting out something embarrassing about how I’d seen him on TV, and instead focused on the drop scones he was expertly flipping on the stove. We ate these topped with scoops of wobbly homemade raspberry jam, whilst we listened to Tim enthuse about his seasonal cookery philosophy. We then proceeded to make a staggering range of food: focaccia studded with roasted beetroot, chestnuts and rosemary, fresh pasta with sage, cavolo nero, chilli and pancetta (from Vale House’s own pigs) and squash ketchup, made by boiling chunks of squash in cider vinegar and spices. Tim explained all the ingredients, methods and techniques in a simple, clear way, making the whole cooking process an utter joy. The lack of emphasis on measurements encouraged us to use our instincts, judging by look, feel and taste more than the constraints of a recipe. This spontaneous, relaxed approach made the day even more enjoyable, as did Tim’s humour and enthusiasm for cooking. Bod then proceeded to bring in several pheasants, with their feathers, heads and feet still attached. We all eyed them with slight trepidation, then watched as Tim briskly made a slit in the skin, pulled the feathers back and, with a few deft flicks of his knife, cut the meat from the carcass. When Tim handed me a beautiful hen with the instructions to ‘give it a go’, I have to admit I felt a little nervous. I laid my hand on its soft feathers, took a deep breath and made an incision in the skin with the point of my knife. The feathers and skin are pulled back as one to expose the breast, the skin parting from the flesh with surprising ease. The sectioning out of the meat is trickier, but I managed to end up with a reasonable amount. 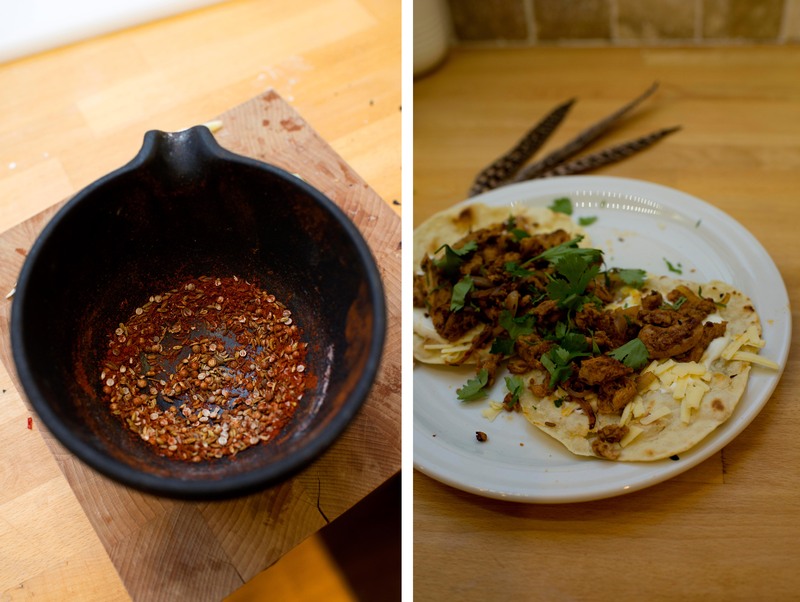 These were made into pheasant fajitas, the ultimate English-Mexican fusion, spiced with coriander seed and smoked paprika, and eaten with flour tortillas that we whipped up out of just flour, oil and water. The course rekindled a passion for simple cookery, where time is taken to carefully select ingredients and build up layers of flavour. 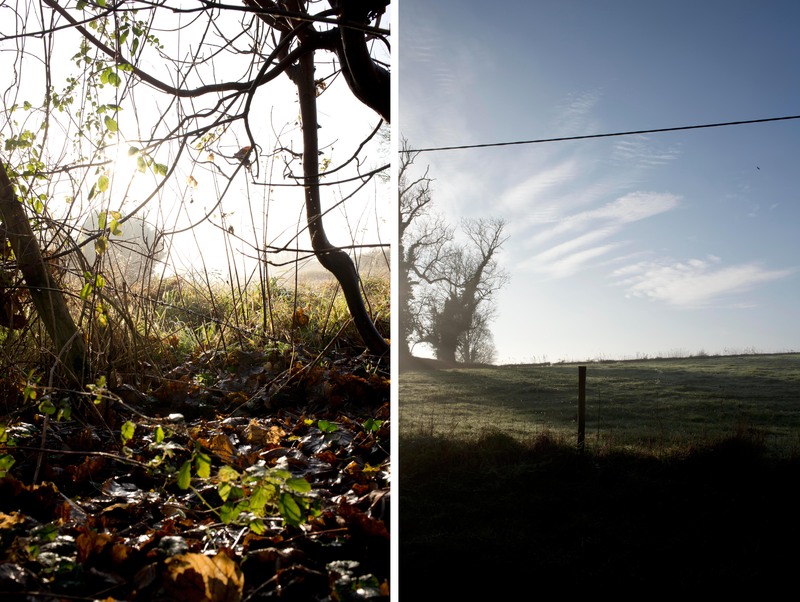 My encounter with the pheasant was a humbling experience, and one that, as a meat eater, I felt was an important one. If I’m going to eat meat, I need to be able to face where it comes from. 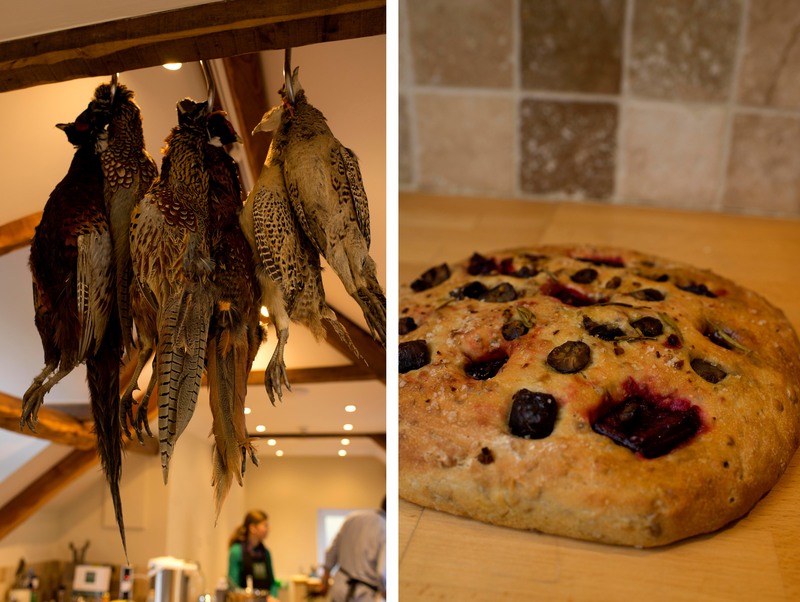 Vale House Kitchen communicates an approach to food that is concentrates on the local, the seasonal, the available and the plentiful. The pleasure to be had from eating seasonally and staying in tune with the natural rhythm of the seasons, as well as confidence to explore this in the kitchen, stayed with me long after I left Vale House. For more information about Vale House and the courses offered, click here.